In addition, You have a home IP address, But also each server you visit along with each web page also has one. But DNS does not let you see it, befor talking about the IP address, let me refer the DNS first. DNS refers to the Domain Name System which is a massive database associating each domain name with some IP address. Once you log into any site, DNS will look up for the IP address in order to send your browser to that IP address and pull data. Do note that most of the big websites have more than one IP address. Basically an IP address consists of a string of characters. Today we have two different formats for these IP addresses. These are the IPv4 and IPv6. What is the IPv4 Address? 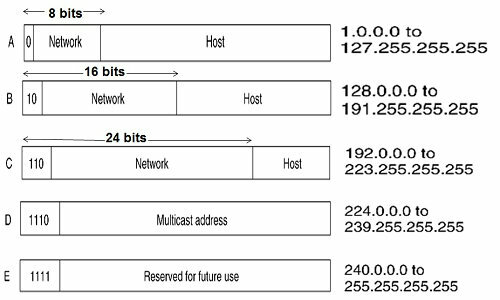 IPv4 – Internet Protocol version 4 is the IP address that has a string of four values. These are separated by dots. The values range from 0 to 255. Thus the IP address ranges between 0.0.0.0 and 255.255.255.255 in any combination. This means that you can make 4,294,967,296 possible IPv4 addresses, after which you cannot make any more combinations. And the IPv4 separate to 5 classes of IP address named from “A to E”. And “Class A”,”Class B” and “Class C” are used for normal Unicast communication,”Class D” are reserved for multicast communication,”Class E” is reserved for future use and experimentation purposes. Here is easy diagram for you to know the IPv4 Classes and the reserved range. Today we have nearly one billion active websites. Even if it is a parked domain, as long as it is a website online it will have an IP address. But still this will not give you an accurate count of the number of IP addresses being used today. This is because most of the large websites as well as corporate web services have many IP addresses that have been allocated to them. In addition, shared web hosting ensures that more than one website is hosted with the same IP address by making use of virtual servers. This means that a single IP address is able to host multiple websites. Now the crisis is that all the IPv4 IP addresses have been used up as they have been assigned to some website or some service, or to some country for their use. There are no more IPv4 addresses available for use. Hence such a situation would ideally mean that we have a limit on the number of websites which can exist on the Internet. But that is not the case as there is an alternative. 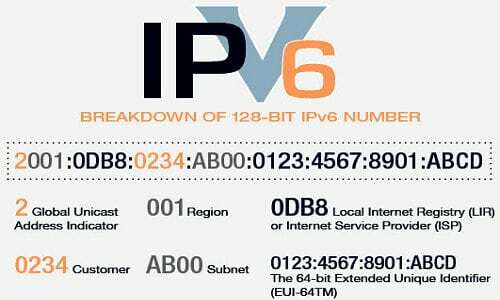 What is the IPv6 Address? This alternative is in the form of IPv6 – Internet Protocol version 6. As compared to IPv4 addresses, there are many more IPv6 addresses available. This becomes clear when you see how IPv6 is formatted. While IPv4 is formatted like 000.000.000.000, IPv6 is formatted like 0000:0000:0000:0000:0000:0000:0000:0000. 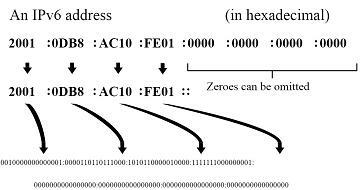 In addition IPv6 has increased availability of IP addresses by turning each digit in to a hexadecimal character and not just a numeral. This means that a 0 in the configuration can be anything between 0 and 9 or between a and f. This makes a much greater number of IPv6 addresses as compared to IPv4. But this is not all. 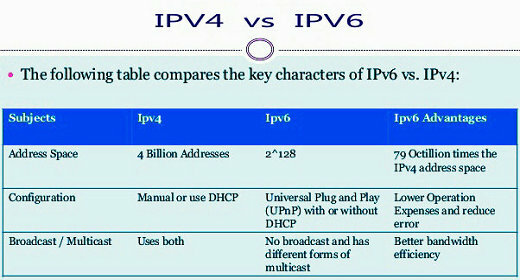 It has many other differences to IPv4 too. Let us look into these also. 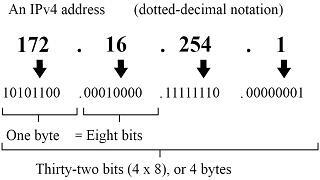 The IP addresses in case of IPv6 can be truncated by simply removing the leading 0s of each group. Next, consecutive zeroes can also be removed and replaced by putting in a double colon, ::, but this can be done only once per address. Additionally, there is the loopback address which can be shortened by removing the leading zeroes. Even these consecutive zeroes can be removed making it so easy to use. Also, IPv6 is a much better platform for Internet communications technically than IPv4. It provides better security and is easier to manage. IPv6 has an element that checks data integrity. Thus packets of data are authenticated to ensure that they are not malware or corrupted. Its ease of management is a great benefit for large companies, countries, and big organizations as they have to manage a wide array of IP addresses. In case of IPv4, one IP address to be filtered through various network address translation. The IP address had to be filtered from external port to any internal device. All this is complicated and hinders communication. With IPv6, the need for all this gets eliminated due to built-in management configurations, and unique addresses being made available. Hence you would have thought that adoption of IPv6 would be taken up by all, but that has not happened. 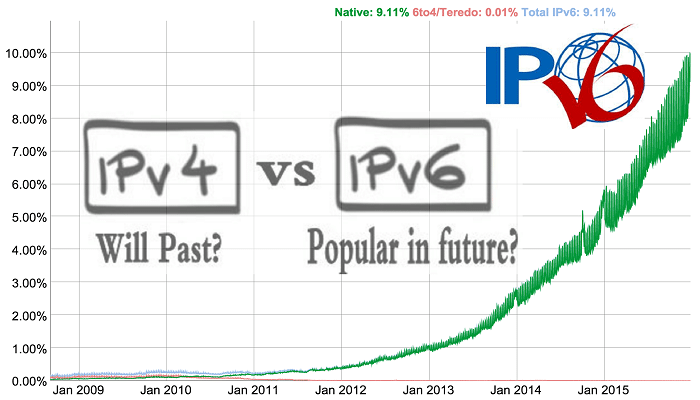 In 2008, general adoption of IPv6 was happening at a 4% rate. Only .2% of global web traffic was happening over IPv6. This meant that just two tenths of one percent of the total global internet traffic was taking place over IPv6. Today we are out of IPv4 addresses as none are left. But we are still nowhere near the adoption levels that are required in order to keep the Internet in complete operation. This is exactly what the crisis is. For countries or companies that are not using IPv6, it is very difficult to access websites which use IPv6 and not IPv4. Hence connection will be slower to these sites and in general too. Reliability will be down and latency will be up. This would make the Internet more difficult to use. Most of the websites are hosted in nations that are fast adopting IPv6. This means that connectivity that is taking place outside of those countries is going to get worse. In fact, those countries would soon be forced to adopt IPv6 or they would be left out of this network for global communications. This kind of pressure is required by the global community in order to force more widespread adoption. 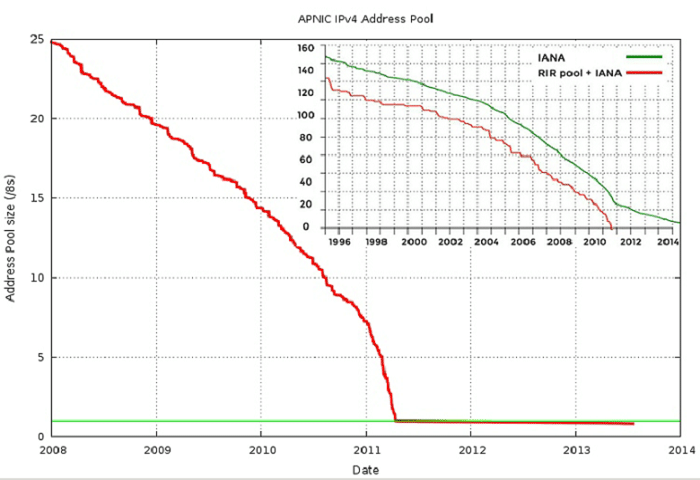 Mainly the reason why IPv6 had not been adopted earlier is because the crisis had not taken placed. Hence businesses, individuals, as well as ISPs and websites did not see the need to upgrade. But now the moment of crisis has come and adoption is rising on a daily basis. The fact is that all of us are resistant to change. This is why it is the pressure of a largely-inaccessible Internet that is going to make total adoption necessary in order to become a participant of the global community. How long that will take remains to be seen.